As some might know, Microsoft runs a Start-up Accelerator Program in several countries. The program is called "unternimm was" in Germany and led by Dr. Carsten Rudolph. weblin is one of the 20 supported companies. Every year there is a campus trip to visit the Microsoft headquarter and interesting people like strategic Microsoft VIPs and journalists. This year weblin got the chance to join the journey with a handful of other start-ups like mediber.de, VIOSO.com, and visumotion.com. Jan Andresen, weblins CEO has met Dave Drach, who is the Director of Microsoft’s U.S. VC and Emerging Business Team. 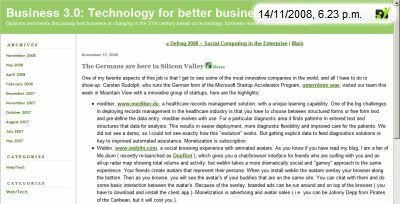 Dave mentioned the visit of the german start-ups in his blog. To read his full article please click the pic.